Bill Walton played college basketball for John Wooden at UCLA from 1971 to 1974, winning the national title in 1972 over Florida State and again in 1973 with an 87–66 win over Memphis State in which Walton made an impressive 21 of 22 field goal attempts and scored 44 points. Walton was the 1973 recipient of the James E. Sullivan Award as the top amateur athlete in the United States. Walton also received the USBWA College Player of the Year and Naismith College Player of the Year as the top college basketball player in the country three years in a row while attending UCLA. 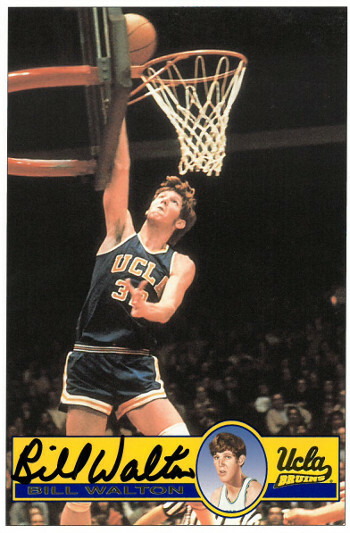 Bill Walton has hand signed this UCLA Bruins 4x6 Photo/Card. Certificate of Authenticity from Athlon Sports Collectibles.